In ever loving memory of my dear husband and our father. 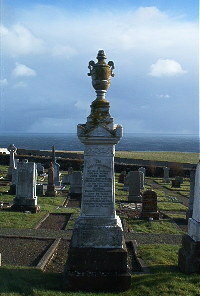 John Gunn farmer Lybster Mains died 24th February 1936 aged 84. Daughter Jeennie Gunn died 7th February 1919 aged 26 interred at Wick Cemetery. Wife Elizabeth Margaret Oag died 7th October 1950 aged 81.